The Soča Valley region stretches from Triglav National Park to Nova Gorica and includes towns like Tolmin, Kobarid and Bovec. Surrounded by the majestic Julian Alps, Soča Valley impresses guests with the unspoiled nature and the aquamarine Soča River that is threading through the Valley. It is a destination definitely worth visiting. It can be accessed from different directions. The nearest airports with international flights are Trieste airport (47,5 km) in Italy, Ljubljana Jože Pučnik Airport (67,8 km) and Klagenfurt airport in Austria (73 km). If travelling by car, the Kobarid and Tolmin area can be accessed from the Štajerska region (Maribor) through Ljubljana, Idrija and Most na Soči, through the Gorenjska region (Bled, Kranjska gora) over the Vršič Pass and through Bovec or through Škofja Loka via Sorica or Kladje. From the Primorska area there is access through Nova Gorica. From Italy one can cross the border at Vrtojba in Nova Gorica or at Robič near Kobarid. The bus route Ljubljana – Tolmin – Kobarid – Bovec and Bovec – Kobarid – Nova Gorica is also a good option, while the train goes from Ljubljana through Jesenice and along the narrow Baška Grapa to Most na Soči. From there it is another 7 km to Tolmin and 20 km to Kobarid (by car or bus). Along Soča Valley and the nearby towns one can find a good range of accommodation facilities. Guest visiting can decide on staying in a hotel, apartment or hostel, while those ready to be one with the nature can even book a wooden cabin or decide on camping. The people of the Soča Valley have known about and enjoyed good food for a very long time. Alongside the Soča Valley are many roads and paths leading to places where the old traditional farm activities are still alive. Today every housewife knows how to prepare the famous local dessert “kobariški štruklji” (a delicious dessert made from dough stuffed with walnuts, raisins and such like), to which the culinary grandees of the town even dedicate a festival. A programme is a mixture of natural and cultural heritage, spiced with adrenaline taste. It is designed for everyone who enjoys unspoiled nature, good food and good vibes. Scenic Julian Alps, jumping into a raft boats on Soča River, tasty meal at Labrca recreational centre and gorge walk are just some of the highlights of this epic trip. The Soča Valley with its pristine and picturesque nature is a paradise for active experiences. Through rafting on the rapids of the emerald river you strengthen the team spirit and admire the beauty surrounding you. The River Soča is suitable for recreation but also for more demanding paddling. 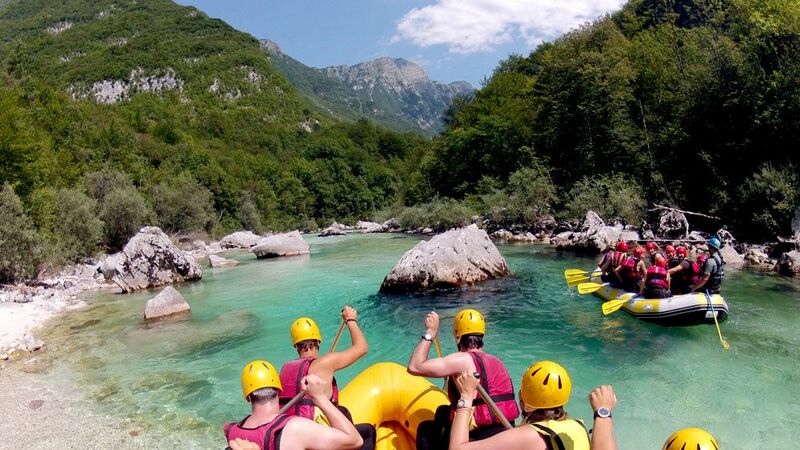 In this programme you will get to know the magic of kayaking and overcome the traps of the rough Soča River. The guides will put you in harnesses and tell you some basics. Then you will start an adventure by sliding on a steal rope crossing canyons 150 meters beneath you. It’s an adrenalin experience you will never forget. Bellyak is a boardsport also known as riverboarding or whitewater sledging. You are prone on the board with fins on the feet for propulsion and steering, ready to face the beautiful rapids of Soča River. Some people find hydropeed to be the most extreme of all our river activities as there is only a board between you and the river’s rapids, waves and rocks. A social hub in the centre of Bovec, boasting two conference halls, a lobby, bar, museum and tourist information centre on the ground floor. The Stergulc House Large Hall has a cinema configuration and can seat up to 100 people. It is a great location for all kinds of events, especially great for small conferences, workshops and cultural events. The LABRCA Sports and Recreation Centre is located in the beautiful natural surroundings, right on the Soča River and only 100 m away from the Tolmin–Bovec (Nova Gorica) main road. It’s an ideal location for various activities and events, and meets the wishes and needs of all age groups. The Museum presents the First World War on the Isonzo Front, focusing on the Twelfth Isonzo Battle, known as the Battle of Kobarid. In 1993, the Museum received the Council of Europe Museum Award recognising its contribution towards European cultural heritage. The Kobarid Museum is also a great venue for receptions, cultural events and small gatherings. The confluence of Tolminka and Soča is located about 100 metres of the city Tolmin. The confluence is well known meeting place for young people, popular walking point for local people and a concert place where many famous music festivals take place during the Summer time. It offers wonderful views of the emerald river Soča and is a great alternative outdoor venue. The Kluže Fort stands at the top of a narrow canyon between the slopes of Rombon and Izgora, which is shaped by the Koritnica River north of Bovec. The time of origin of the older fort at this site is not known, but a wooden building stood there already in the second half of the 15th century to defend the Friuli Plain and the Venetian Republic against the Turks. Today the fort serves as a historically important object housing permanent exhibitions and a cultural centre that hosts the Kluže festival, a festival of ambient theatre arts. It can be a great option for an event that calls for a bit of charm and historic atmosphere. Since 30 June 2007, the outdoor museums and the most important remains and memorials of the Isonzo Front in the Upper Soča region have been connected into the Walk of peace. It is dedicated to the memory of the multitude of casualties of the First World War. Its purpose is to present to visitors the cultural-historical points of interest and natural amenities of the Upper Soča region. Walk to the spring situated in the Sopotnica stream gorge above the village of Gabrje. According to local tradition this water was carried to the Tolmin count at the castle on Kozlov rob in wooden containers. He believed that this water would keep him forever young. The Count’s water is considered to have healing characteristics. It is clean and rich in minerals. It has a positive effect on the entire body. According to measurements using radiesthesia it is one of the best in the world. Explorers of the underground world will find many interesting sites with the potential for everything from leisurely tourist excursions to more demanding expeditions. In Zadlaška cave, the Renaissance poet Dante Alighieri supposedly found inspiration for the terrifying images of his Inferno. The Soča Valley is situated at the juncture of Mediterranean, Dinaric and Alpine worlds. The exceptionally dynamic terrain and numerous mountain and forest roads and cart tracks give plenty of opportunity for mountain biking. Less demanding visitors will be fully gratified by biking along gentler roads that interconnect villages in the valley. Soča Vally is the home of many festivals that take place throughout the year; Soča trout festival in September, A month of local culinary specialties and JESTIVAL – Food & Art festival in October, The Drežnica festival which is one of the more known Carnivals in Slovenia, sport festivals like Soča Outdoor Festival, Podbrdo Trail Running Festival and Hiking festival, music festivals like Metaldays, Punk Rock Holiday, Overjam international Reggae festival and Creative camp Sajeta. Among sport activities attracting an increasing number of those fascinated by adrenaline adventures to the Soča Valley today, paragliding with outstanding thermals, steep mountain slopes and unforgettable panoramic views offers top flying opportunities and long cross-country flying above the Julian Alps.